Team Honda's David Bailey went 1-1 at his hometown national at Lake Sugar Tree in Virginia. 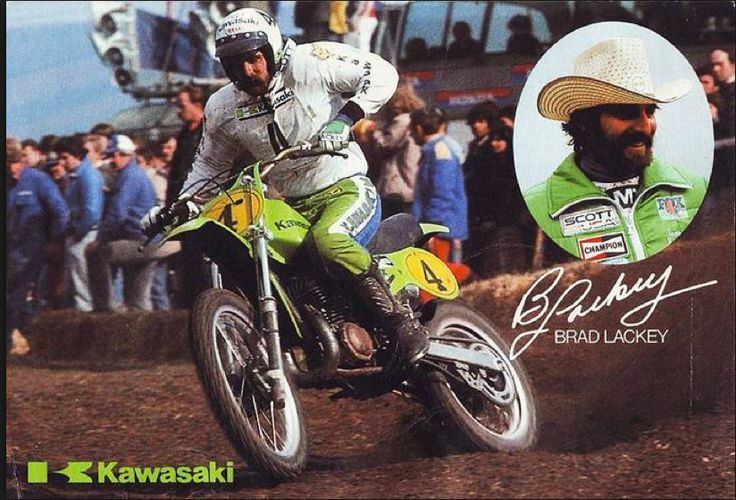 Bailey was helping promote the race as well as participate, and he topped teammate Rick Johnson's 2-2 and Kawasaki's Jeff Ward's 3-3. In the 125 Class, Suzuki's George Holland bettered Honda riders Guy Cooper and Willie Surratt. 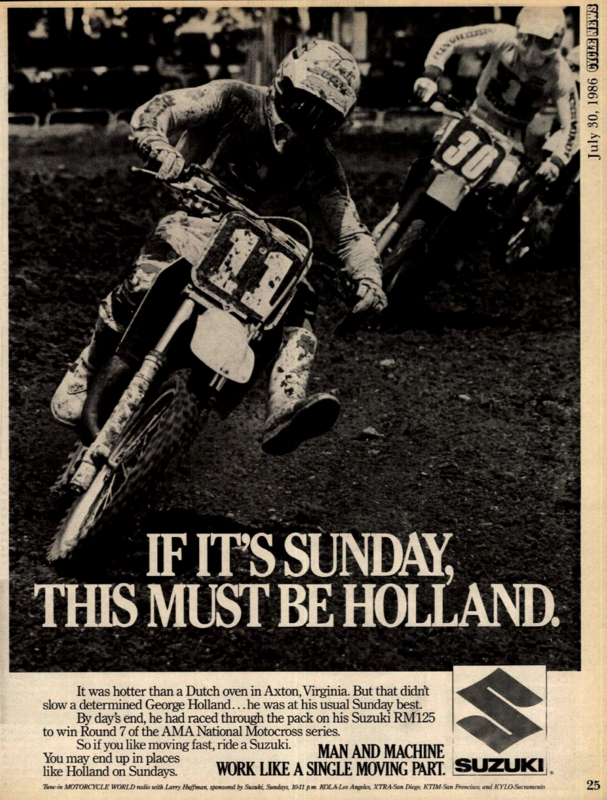 Dutch sandmaster Kees Van der Ven swept both motos in the Netherlands, leading KTM rider Benny Wilson and Suzuki's Georges Jobe in the first moto and Husqvarna rider Ekki Sundstrom and Suzuki's Jan Van Mierlo in the second leg. Kees Van der Ven was Maico's last GP winner. 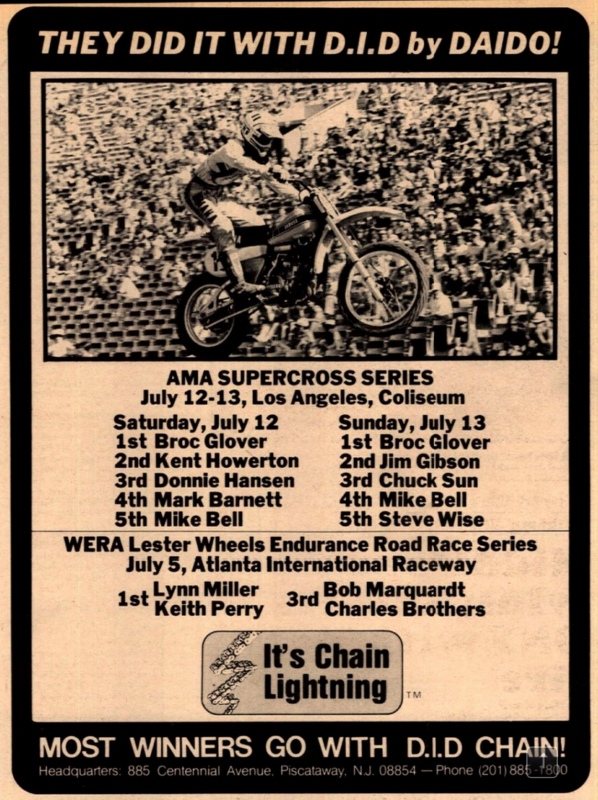 And on the second day of the Los Angeles Coliseum doubleheader, Broc Glover won again, this time followed by Honda riders Jim Gibson and Chuck Sun. Also on this day, the AMA announced that the upcoming Trans-USA Series (previously the Trans-AMA Series) was now going to be for 250cc motorcycles rather than the Open class. They also announced that the winner of the series would get an ironic bonus: a brand-new Pontiac Trans-Am. James Stewart kept on winning at Budds Creek, running his unbeaten streak to seven straight 450 Nationals and 14 straight motos aboard his Chevrolet Kawasaki. His teammate Tim Ferry went 2-2 for second, with Honda's Andrew Short third with 3-3 scores. In the 250 Class, Monster Energy/Pro Circuit Kawasaki's Ryan Villopoto topped Rockstar/Makita Suzuki rider Ryan Dungey and Australia's Brett Metcalfe. St. Gabriel, Canada, hosted a round of the FIM 500cc Motocross World Championship, and Belgium's Andre Malherbe grabbed the overall win aboard his HRC factory Honda with 3-1 finishes to the 2-2 of Andre Vromans and the 1-4 of Kawasaki factory rider Brad Lackey. In Venezuela, Stefan Everts took the 250cc Grand Prix overall win with 1-3 finishes. Germany's Pit Beirer won the second moto, but a DNF in the first moto cost him a shot at beating Everts for the overall. 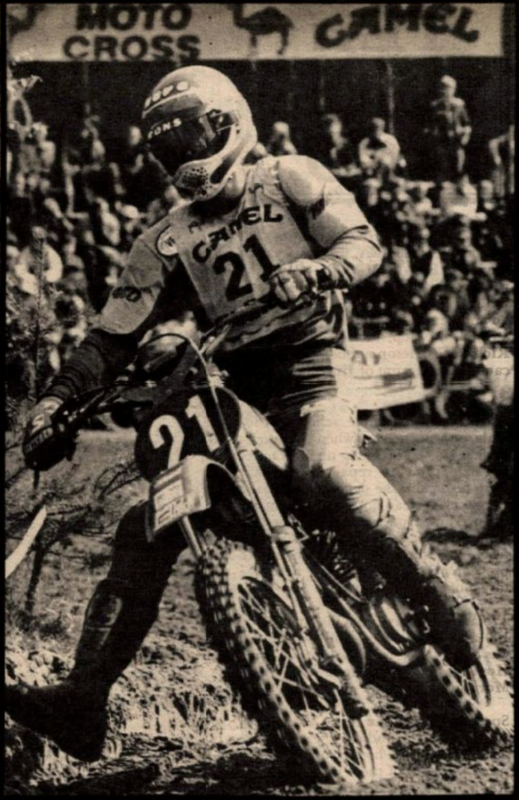 And in the 125cc Grand Prix of Finland, American rider Bob Moore won the first moto but was a DNF the second time out. The winner of the second moto and the overall after running second in the first moto was Yamaha-mounted Alessio Chiodi, who would go on to win the world title that year.